A report this week from the Australian government’s National Industrial Chemical’s Notification and Assessment Scheme (NICNAS) shows what’s in the ink that’s under the skin of more than 2 million Australians and about 100 million Europeans. And it’s not pretty. The report found 471 different tattoo inks likely to be used in Australia made up of 89 unique chemicals. They interviewed 22 professional tattoo artists and sourced 49 specific tattoo inks likely to be used in Australian tattoo parlours for detailed chemical analysis. Of the 49 inks NICNAS tested, only four complied with the European standards. The major concern was the presence of polycyclic aromatic hydrocarbons (PAHs), a group of chemicals known to be carcinogens. PAHs were found in more than one-fifth of the samples tested and in 83% of the black inks tested. Other non-compliant components include barium, copper, mercury, amines and various colourants. In some inks, there was a mismatch between the content and the labelling. One ink was sold and used for tattooing when the container label said it was not intended for this purpose. Gone are the days of tattoos being seen only on bikies and sailors. Increasing proportions of the population have increasing proportions of the dermal layer of their skin injected with the multi-coloured artworks. There is no sign of demand dropping off. This is an international challenge for regulators. Italy, for instance, had an eight-fold increase in the number of tattoo parlours from 2006 to 2015. Like us, they struggle to monitor what the effects might be. Swiss health authorities analysed 416 ink samples and found 39 colourants that were never tested for use in contact with the human body. Traditional Maori tattoos (moko) are a treasure protected by the Treaty of Waitangi, so regulation in New Zealand has special challenges. It’s important to remember that humans have been tattooing their skin for thousands of years using various methods, some very crude. 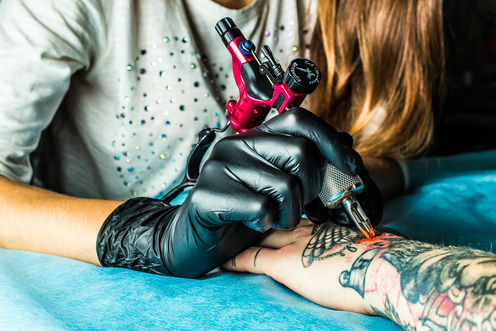 Outside the risks of infection from unclean injecting equipment, and some serious pre-existing medical conditions, there is little evidence directly linking tattooing to serious illness. However, a German study found 67% of tattooed people reported complications. Of those, 7% were systemic (affecting more than just the skin around the tattoo) and 6% were persistent. These are mostly superficial skin infections but have included bacterial infections such as staphlococci and streptococci, mycobacteria and, in some rare cases, blood-borne viruses such as hepatitis B and C.
So what does all this mean? In short, no one really knows. Will everyone with ink get cancer? No. But the basics of toxicology tell us that the harm any substance does is influenced by how “poisonous” the substance is, the circumstances and nature of the exposure, and the dose people are exposed to. Is there a prospect that with more people getting more tattoos, cancers linked to this exposure will occur? Again, we don’t know. Specific concerns that tattoos might cause or mask skin cancer seem – so far at least – unfounded. It seems timely to establish a study to follow up on those who have tattoos and how they fare compared with those with a “blank canvas”. The simple truth is, we have no idea what, if any, long-term health effects go with having tattoo ink injected into human skin. Another complexity is the “DIY tattoo”. Controlling the ink administered by paid tattoo artists in identifiable businesses is one issue. Controlling the ink that comes through online shopping and is administered by enthusiastic amateurs at home is quite another. These chemicals can undergo photo degradation under exposure to … solar radiation and lasers. This means the chemicals, instead of being trapped under the skin, are released into the body. And it’s unclear what effect this might have. As tattooing becomes increasingly mainstream, we need to ensure those who are considering getting tattooed are fully informed of the risks. And if they wish to proceed, we need to ensure they can do so as safely as possible. Stopping the use of unsafe ink and related contaminants is a vital first move. This report from NICNAS is an important step towards us getting this house in order. Should we eat breakfast like a king, lunch like a prince, and dinner like a pauper?